After the rain slowed down I decided to head back to the truck. From there I would decide whether to go home, or try another spot. I had seen no movement. 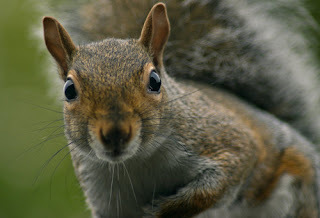 I believe the squirrels were smarter than I was and were staying high and dry in their homes. I arrived as my truck soaked. I hate having wet feet and mine were soggy. I was keeping a good attitude, enjoying the wildlife I had seen, but was not sure how much more I could stand to enjoy! I checked the radar on my iPhone and could see that there would be no more storms for a few hours, so I stripped off my rain gear and drove to another location. "Yes, I am smarter than you." The second place I chose to hunt was a little higher and had no standing water. There were mosquitoes, but not nearly as many. The sun came out and with it came the squirrels. After a short hike I could hear several barking in the distance. I zoned in on the closest and began stalking it. The nice thing about rain is that it is much easier to stalk when the woods are wet. I can sneak though with barely a sound. Unfortunately, critters don't make as much sound either. I primarily hunt squirrels by listening for them. I usually don't actually see them until they are well within range. With the woods being wet I was limited to hunting by site only. I would see a squirrel and then instantly loose it in the brush. I would have no way of knowing where it went because I could not hear it. This was both frustrating and a fun new challenge. Eventually I had a clear shot. I shouldered my rifle, looked through the scope, and saw..... nothing. My scope was completely fogged up. With the sunshine came a tremendous increase in humidity. I quickly untucked my shirt and wiped the scope lens with my shirt tail. Unfortunately, my shirt was so wet from rain and perspiration it did little good. By the time I could see through my scope the squirrel was long gone. The squirrels were thick in this area, I had movement everywhere. It was so thick and the little buggers were so active I couldn't get a clean shot off. Eventually a squirrel cooperated and sat still. I settled my cross-hairs just behind its eye, squeezed at trigger, and..... click. A dud! Duds are always a real possibility when using a rimfire, but I had never had a .22 magnum dud. They are usually a little more reliably than Long Rifles. It was at this point that I decided to find another area, this one was just to thick. I am going to visit it again with a shotgun. I had an hour and a half of light left, so a headed to another area I wanted to check out. It was much more open, with a fast running stream running through it. Here I had several more shot opportunities, but was not able to take any. The humidity was unbelievable. 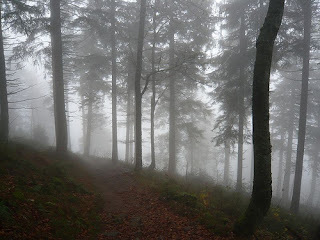 I was having trouble seeing the tops of the trees due to the mist. I could not see through my scope because my breath was fogging the lenses of my glasses when I brought the stock to my cheek. It was ridiculousness.